When HandyMan and I start planning a room, we start by drawing and drawing and drawing. On the backs of envelopes, restaurant napkins, notebooks, old telephone bills, whatever scrap piece of paper is nearby soon becomes filled with our doodles. At some point though, we put those sketches into some electronic form so we can get a sense of space and style. There's nothing that helps to visualize a room better than a plan drawn to scale or a 3D version that you can move and twist about to get perspective. 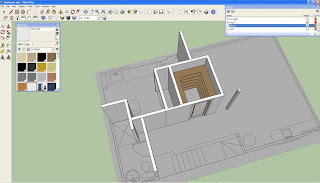 Usually, the first tool of choice in our design toolkit is AutoCAD, but that's only because HandyMan uses it every day in his day job and is very familiar with it. 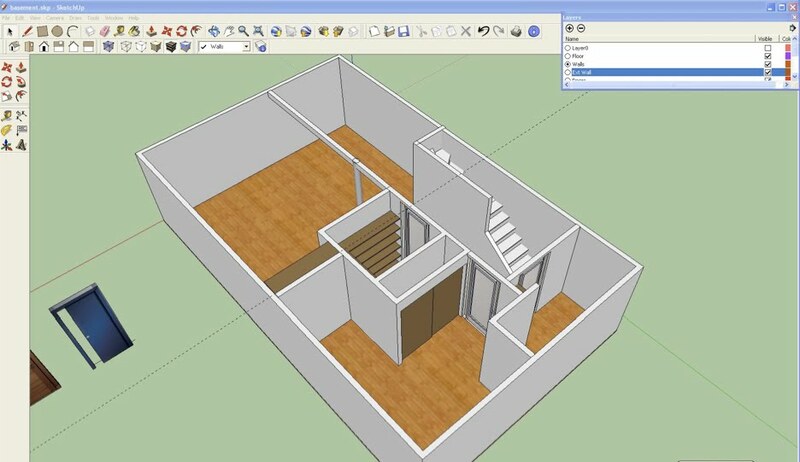 Its pretty nifty though for drawing up floor plans or elevations and adding in elements of a room like fixtures, furniture, and tile. It was really helpful when we were deciding on the tile pattern for the bathroom. Pretty cool, eh? 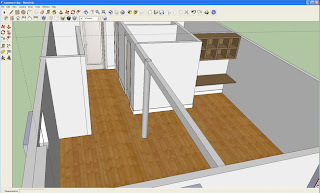 When you're planning a large space or multiple rooms, Google SketchUp is really useful. You can do things like add textures and colour, remove parts of the model (like exterior walls), and swoop in like a bird and see your plan up close. So that's what's in our DIY design toolkit. Can you tell we like to plan things out before we build? I'll be sharing some of our plans with you in future posts and illustrate how good planning really does help you design better. I just tried using google sketch up recently. I wasn't very brilliant at it. I guess I'll have to keep practicing becuase your little models look great - thanks for sharing! those look really good. Thanks for the tips. Thanks for sharing. 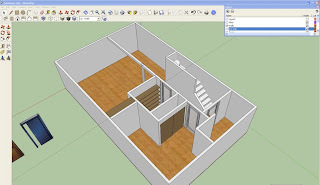 I had never heard of Google Sketchup - it sounds really interesting, although I'm wondering if I'm patient enough to learn to use it. I have never heard of this but I should not be surprised because they always have such good stuff. I think we are definitely going to have to use it for our basement (if I can figure it out). Your model looks great! I'm sketch-up challenged and ikea kitchen design isn't compatible with a mac so I get the mathematician to draw me a scale blueprint - so old school! I know your basement will turn out as spectacular as the rest of the renovation! I have been trying to find an online mood board resource for a while now. Polyvore is it! Thanks so much! I tried sketchup about a month ago...lets just say I will stick to paper and a dull pencil whose eraser is worn out and smudgy. Can't wait to see these tools in action! This is an awesome post! Sadly i have been doing things the old fashioned way - crossing my fingers and hoping the end product turns out well. These tools will definitely help to visualize the finish space and minimize mistakes. Thanks so much for this. The only other tip i have to share, is if there is anything DIY related that you haven't done before or are unsure about - it's worth trying YouTube to see if anyone has posted an instructional video. Hello Lover, Shannon, modernemama - I hear you. 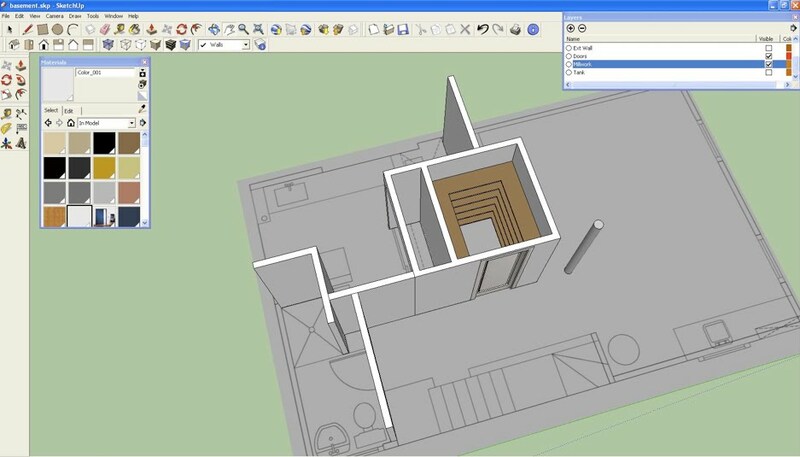 Let's just say there is one sketchup expert in this family and it isn't me! Roncie Vic - great tip! I always forget about YouTube.